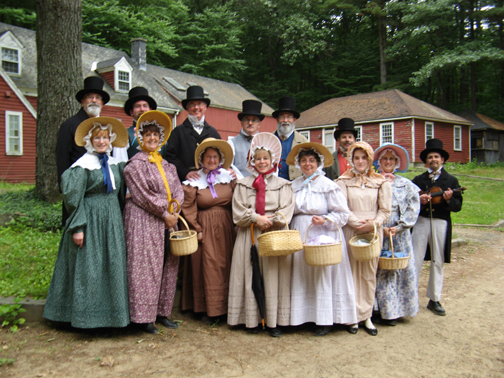 Being a huge fan of anything penned by Laura Ingalls Wilder and living history museums as a child, it was my fantasy to eventually live in a place that was a cross between Walnut Grove and Old Sturbridge Village when I grew up. A town where the men drove buckboard wagons and tilled the fields, the women wore sunbonnets and churned their own butter. All the intrusions of twentieth century life would be banished, except for flush toilets and dental floss; and maybe Laverne and Shirley watching on Tuesday nights. Where neighborliness, community and penny candy would prevail. If I couldn’t find this 19th century Shangri La (filtered through the lens of a latch key child of the 70’s), I figured joining the Amish was always an option. As I aged and my dependence on technology and urban amenities grew, dreams of a quasi-nineteenth century lifestyle faded. I do live a sort of vintage lifestyle today, but my lacoste shirts, LL Bean Norwegian fishermans sweater and lack of cable television put me squarely in a 1970’s, rather than 1870’s era. Cautionary tales courtesy of M Night Shyamalan’s The Village aside, my period living fantasies were recently reignited by 21st century technology, when I learned via facebook that a family had recently established an apothecary and herb farm in Germantown. Delighted, I imagined their entry into town, Pa and Ma pulling up in the covered wagon, calico-clad kids in tow (for the complete audiovisual reference, click here). I was anxious to meet them, and began thinking of how I could introduce myself to make them feel comfortable. I narrowed the choice down to either calling myself the town cobbler or the town smithy. Having neither anvil nor cobblers bench handy and unable to produce shoes for the childrens’ nor the horses’ feet as a welcome to town gift, I decided to forgo formality and just drove over in my jeep. 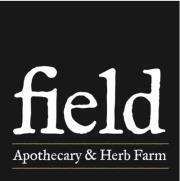 Field Apothocary & Herb Farm is located right on Main Street in Germantown. It’s not marked by a claim shanty or soddy, but a neat white twentieth century house. I walked around the side and was greeted by the farm’s proprietors, Michael and Dana Eudy, carrying a large sink across their yard and into the house, where they are in the process of renovating their kitchen. The couple, with their kids, moved to Germantown from New York City about a year ago, and this was the first year of the farms operation. I was immediately struck by their warmth and friendliness as they began to show me around. As they guided me through the operation, I was amazed at how much the two of them had accomplished in their first season. A small greenhouse had been erected, numerous beds have been established and an impressive variety of herbs at different stages of maturity were growing on the 3 1/2 acre property. As different plants have different optimum growing conditions, the couple have amended and worked the soil in a very responsible way, adapting it to replicate an individual type of herb’s native earth, and encouraging nature to do perform its intended role in the process. What blew me away most of all was their encyclopedic knowledge of the various plants. They were enthusiastic, encouraging me to touch and smell the various herbs while highlighting the practical applications of each. Familiar plants such echinacea, hops, and lavender where growing along herbs whose names were foreign to me. In place of a buckboard wagon, a white truck stood at the edge of the fields. Dana explained that it was going to serve as their mobile apothecary, selling medicinal herbs and tinctures as well as beverages. They hope to have it up and running very soon, and plan on going from town to town serving local communities on a weekly basis. 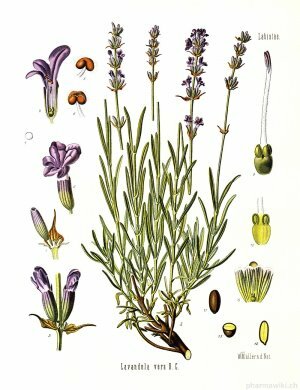 Dana prepared a lavender tincture for us, and explained the process of making it (tinctures being a new concept for me). It was very refreshing. That, coupled with learning lavender has calming qualities was enough to make me a convert almost immediately. Image courtesy of Field Apothecary & Herb Farm's facebook page I also learned from Michael that lavender is good to use as a natural sleep aid. I am determined to try it as an alternative to Ambien. In addition to their optimism and energy, I was struck not just by their belief in their venture as a business but also in the power of herbs, natural medicine and a desire to provide a service to the local communities. I left looking forward to getting to know them better, and watching the apothecary and herb farm grow and prosper over the coming years. I was happy and heartened by what I saw. Even though I don’t live in a town where everyone drives their buggies to church each Sunday, gathering to sing “Bringing in the Sheaves”, the realization that old fashioned values exist in the best possible sense, and technology has given us the tools to learn more about traditional land stewardship and age old medicines, makes me think I am living in a place closer to my childhood fantasy than I ever imagined I would.